Istanbul (AFP) - Istanbul police fired tear gas Friday at thousands of women who took to the city's central avenue on International Women's Day in defiance of a protest ban to demand greater rights and denounce violence. Security forces in riot gear pushed the crowds of women -- some wearing colourful wigs and masks -- at the entrance to the city's main pedestrianised shopping street Istiklal Avenue, an AFP correspondent reported. Police then used tear gas on the marchers and menaced them with dogs, causing many protesters to flee onto side streets. The Women's Day event took place peacefully last year but authorities issued a statement banning any demonstration on the city's central avenue just before this year's march. Ahead of the protest the area was flooded with police who set up cordons around the central Taksim Square, while many local shops were closed. One woman, called Ulker, speaking to AFP from behind a barrier, said: "Here is the bitter truth: There is a system, there is a state that is scared of us. I condemn this." Thousands of demonstrators were eventually allowed into a small part of the avenue to stage the protest. They unfurled banners that read "Feminist revolt against male violence, and poverty", and "I was born free and I will live free." The demonstrators also chanted slogans including "We are not silent, we are not scared, we are not obeying." The crowds then became trapped between two security cordons and were subsequently dispersed by the police using tear gas. 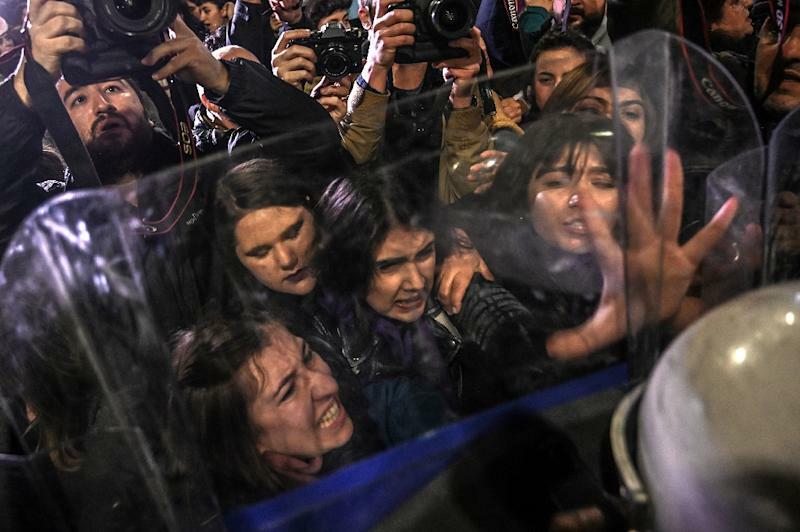 Women's activists have long accused President Recep Tayyip Erdogan's Islamic-rooted government of not doing enough to stop violence against women. In 2018, 440 women were killed in murders linked to their gender, according to the women's rights group "We Will Stop Femicide", compared with 210 in 2012. The issue was highlighted on Thursday when Turkish pop singer Sila went to court to accuse her boyfriend Ahmet Kural, a famous actor, of beating her. The case was a rare instance of a celebrity breaking the silence that surrounds abuse in this conservative society in which traditional, patriarchal attitudes are dominant. "As you know in Turkey violence against women is very high. The government is doing nothing to stop it. That's all we can do: to come here and speak up," one protester, Gulsah, on Istiklal Avenue said. 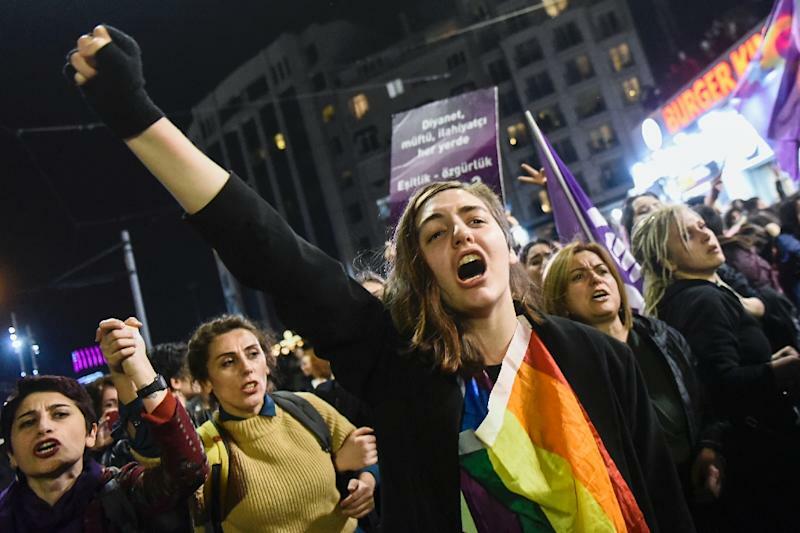 In the capital Ankara, hundreds of people took part in a smaller Women's Day rallies, whistling, cheering and clapping as they walked and shouting "we will not be quiet." Some chanted: "Men are killing and the state is protecting killers." 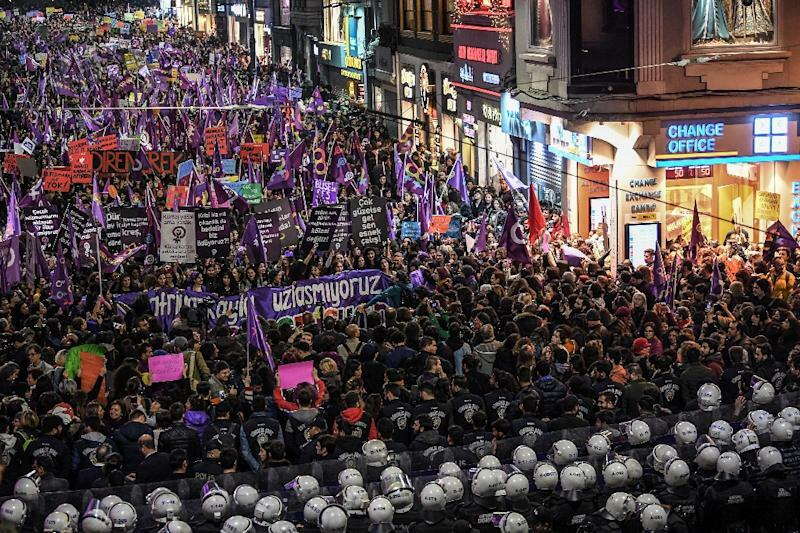 Large scale protests are rare events in Turkey since mass 2013 anti-government rallies, which were seen as a major challenge to Erdogan's government.